Responsive websites are those that resize images and rearrange content to appear organized on both desktop and mobile devices. 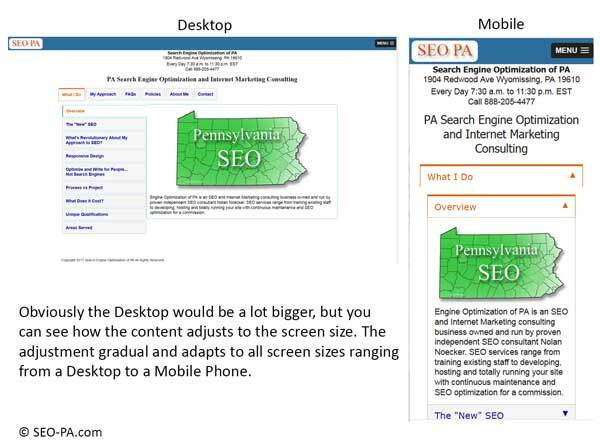 Responsive design is critical because in most instances 50% or more of your traffic comes from mobile devices. There are two approaches to responsive websites. You can always do a more thorough and creative presentation on a desktop computer. That's because you have a bigger canvas and usually a faster connection for speed. You design a second mobile-friendly page for smaller devices to access when screen size and download speed is a bigger consideration. Code transparently directs visitors to the page that best suits their device and connection speed. It's usually the best but the most expensive approach because you have to maintain and coordinate the information on two pages instead of one. Depending on what your website's purpose or goal, you may not need a more comprehensive desktop presentation. There is no problem with duplicate content penalties if the pages are coded correctly. One page works work for all devices. It's less expensive, but you may sacrifice content, and features that might otherwise be displayed on a desktop version only. However, this is less of a consideration because you can implement code to selectively show content based upon the screen resolution. Most businesses use this approach because of cost and maintenance considerations. Beware of responsive designs that float icons over the copy as the screen becomes smaller. It looks " cool' but it obscures the content which isn't cool at all because it detracts from the website's usability. On a Mobile Phone: simply rotate the phone from portrait to landscape mode and watch the images resize, and the layout adjust to accommodate the new screen size. On a Windows Desktop: left click the Restore Down button at the top right corner of your browser. Adjust the width by dragging the right edge of the window and watch the images and the layout resize and or reposition to accommodate the window size. Contact Me Online or Call Me at 610-334-7463 to discuss which approach is best for you.